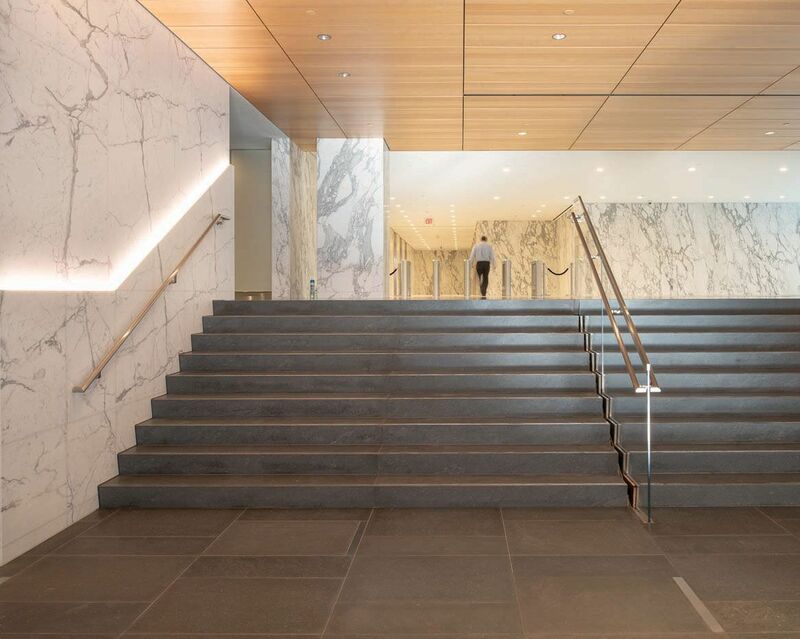 This ambitious project mergies two existing office buildings into one larger structure, creating the largest office building lobby in Washington. The building utilizes 90,000 ft² of stone. Alexander Court offers frontage along four major thoroughfares, including an expansive lobby fronting L and 20th Streets featuring an iconic twelve-story atrium. 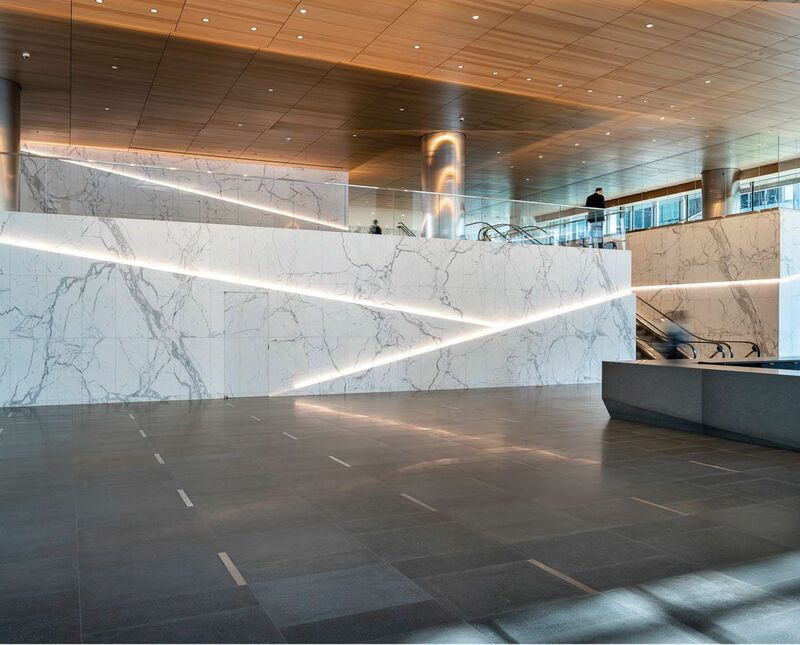 The project architect desired to use only the finest Statuario Venato Extra marble for the 15,000 ft² of lobby wall stone. 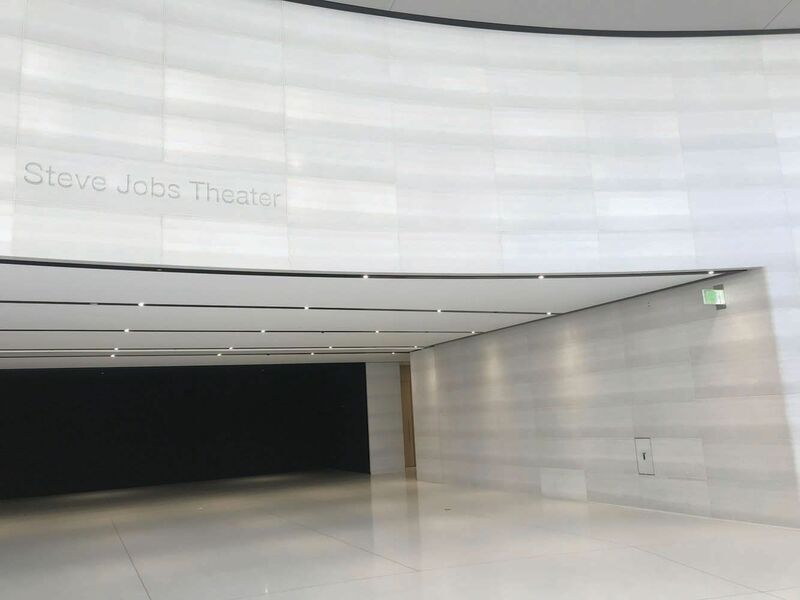 Continuous vein pattern matching on the lobby walls, some as long as 180 feet, replicate the vein pattern of the quarry wall face. Innovative virtual dry set software allowed the designer to see the actual slabs selected for each wall in true shop drawing elevations. This highly detailed process yielded unprecedented results for the marble’s finished appearance. 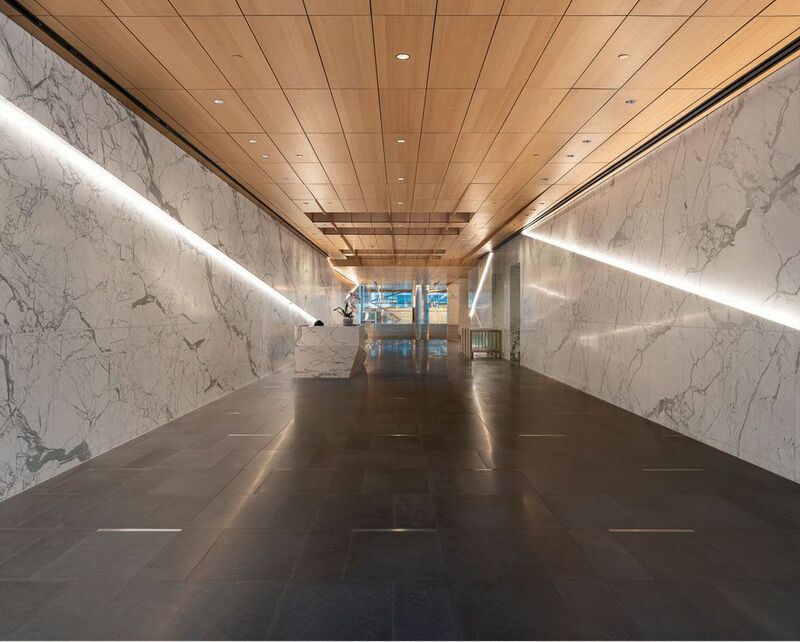 Beyond the main lobby, the entire project relied on the Statuario and the Basaltite basalt for all the paving and wall surfaces at the sky lobby, the fitness center, penthouse lobby, and the 16 elevator cabs that feature marble manufactured onto lightweight aluminum honeycomb wall panels. Jet Mist granite paving, steps and solid planter walls were used for the building entryways. 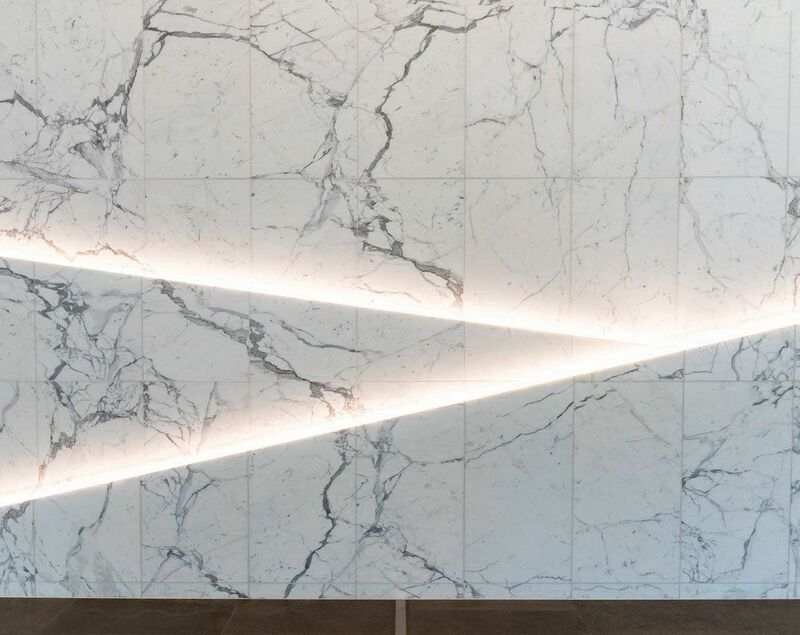 The public lobby and core bathroom ﬂooring is more minimalist and relies on the dense and durable grey/black Basaltite, accented with inlaid stainless-steel pavers, to provide a subtle-yet-strong foundation for the striking marble wall features. Bathroom vanities are topped with Arabescato Vagli marble. 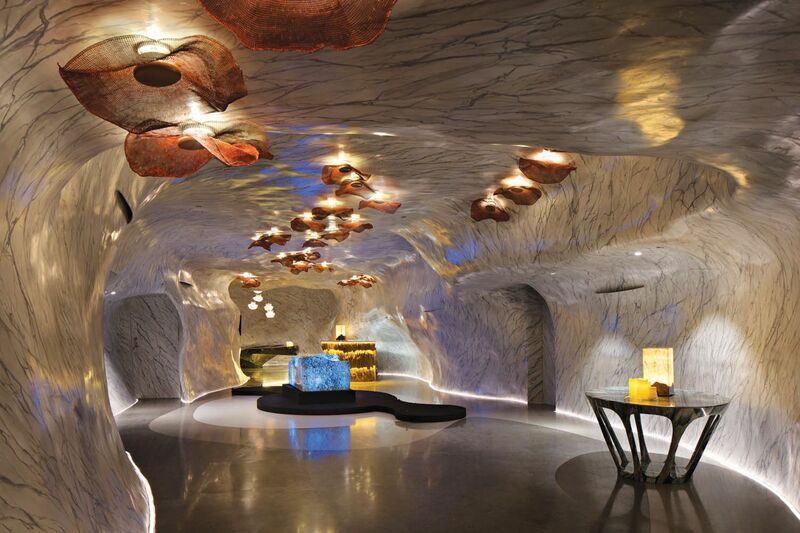 The lobby desks are all clad in stone as well and exhibit a complex geometric design. 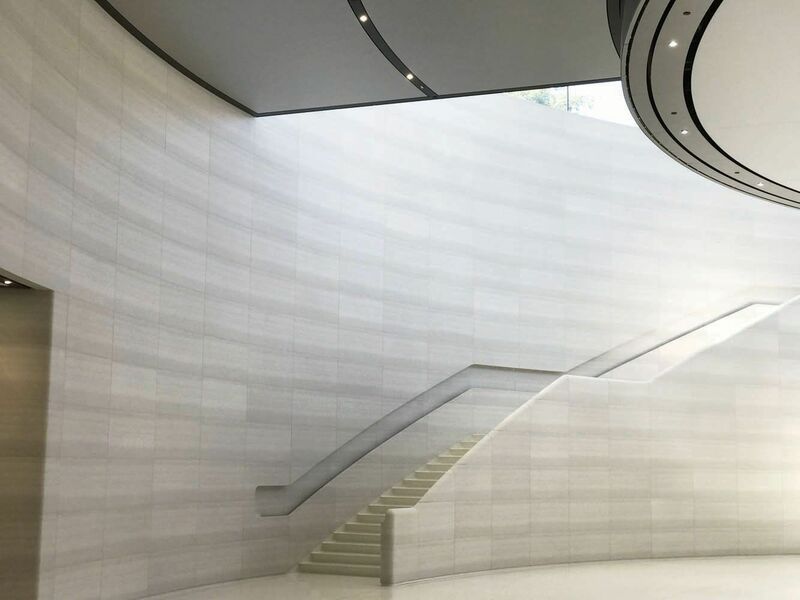 Approximately 12,000 ft² of heavily veined Serpegiante limestone from Italy was applied as two major elements: 2" thick radial wall cladding and 10" thick, two-piece carved handrails. The design requirements of this project specified precise radial fabrication of +/- 1 millimeter and 1/4” custom sanded caulk joints with -0" to + 1/32" tolerance. 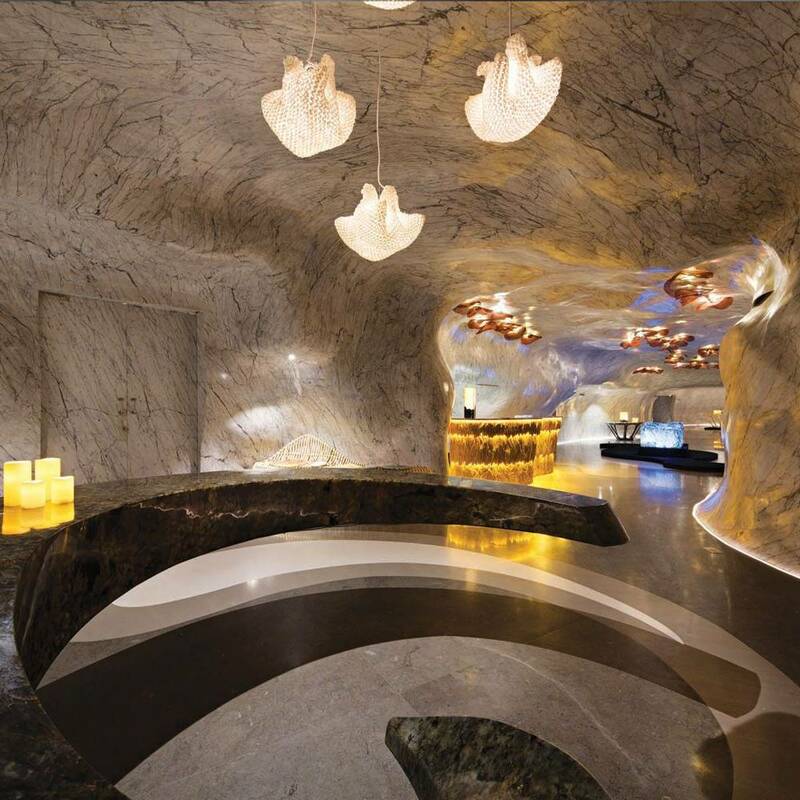 Material was selected from only half of the limestone quarry bench level 4 to get the specific color and veining for blending. The first block was cut to the thickness required for radial wall cladding or handrail pieces. Rough slabs were cut and dry-laid for initial review of color and characteristics. Once an area was approved, individual pieces were sent to 5-axes CNC cutting machines for rough carving. The pieces were dry-laid again to assure the quality established for color and blend was still being met. Once all pieces in a group were fully approved, they were sent to the Andrusko Group of artisan carvers for detailing then moved to an offsite sandblaster for finishing. All finished pieces were returned to Campolonghi for final detailing, one more dry-lay, final cut-to-size and touch up. Final approval by Apple was required before the stone could be loaded for shipping. During the inspection process each piece was given a unique mark, including details for positioning to assure that each piece was located correctly on the wall. The support of the stone involved a custom-designed series of tube steel and Unistrut, to allow for a very tight tolerance installation. Custom color sanded caulking was selected due to the high seismic design requirements in California. 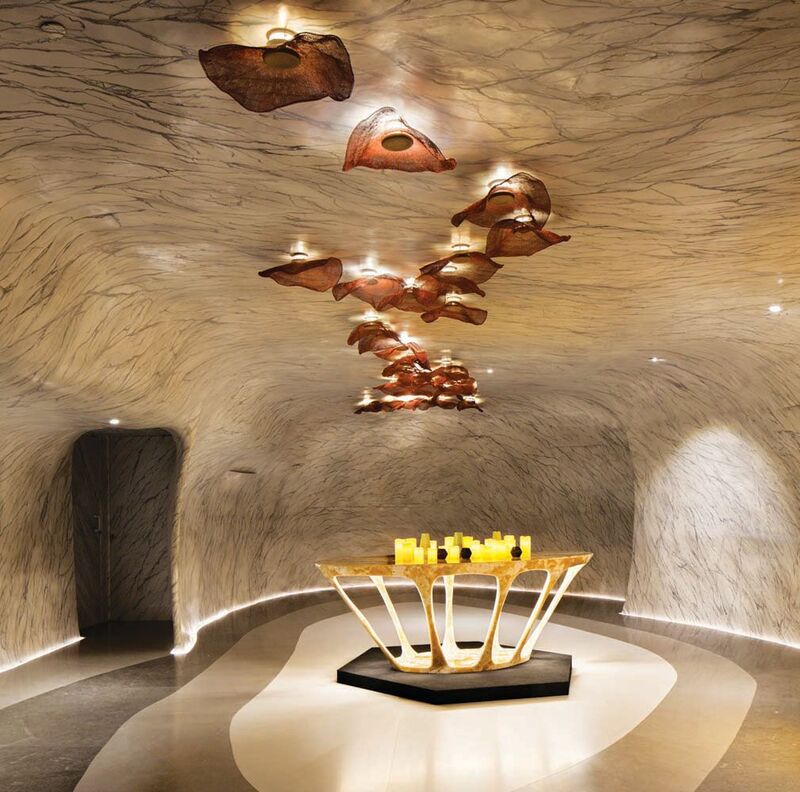 Inspired by the underwater world in the story of Finding Nemo and born from a desire to break the perception that marble is rigid and heavy, MM Galleri acted on these ideas and had the “Bent and Light” project created as their stone showroom. 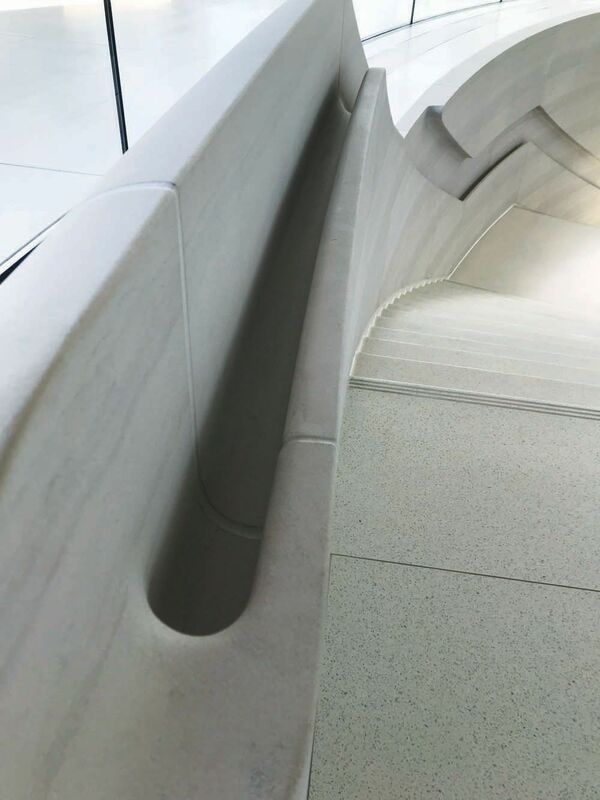 This new bent-marble technology was not only applied to the showroom’s floors, walls and ceilings; it also forms the creation of furniture pieces, such as a bar counter, spiral-shaped table, benches, and more that maximizes marble’s ﬂexibility and versatility. 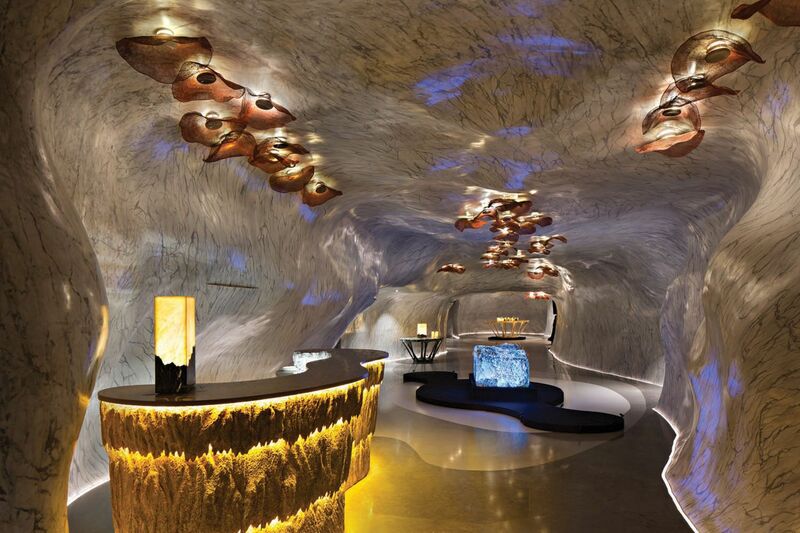 Bent and Light utilized a proprietary process for reinforcing thin slices of marble with fiberglass to aid ﬂexibility to recreate the underwater experiences depicted in the movie. Bent marble imitates the shapes of those environments including a garden with corals, jellyfish, and other underwater life. Decorative lighting is also a critical part of the design. Challenged with how to apply the thin marble pieces so that the patterns achieved a continuous veining appearance, the team covered the seams with a special treatment to make the joining pieces appear more ﬂuid. 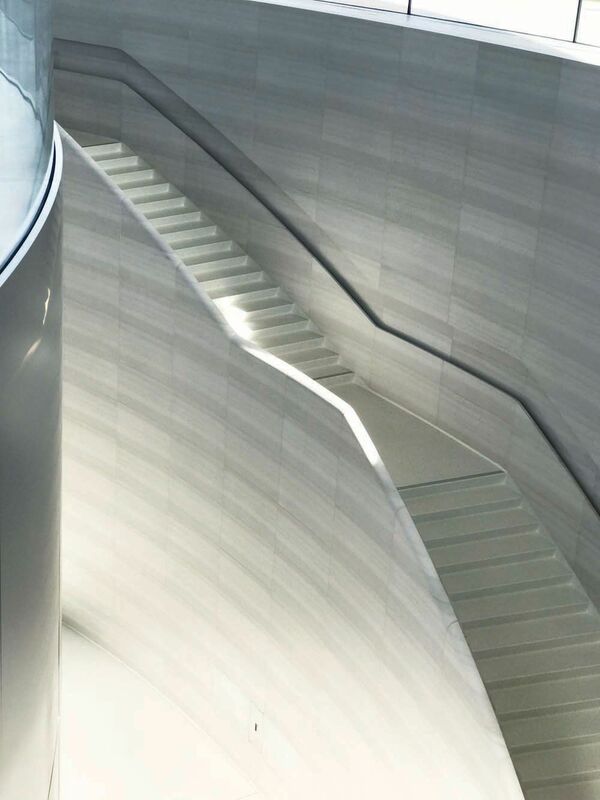 The innovator’s inspiration became reality in his desire to maximize the use of marble but also reduce stone waste. This method requires only 5% of natural marble material compared to a normal application since the resource is utilized more-efficiently and minimal waste is produced. Fabricated in Indonesia, the process required the incorporation of a model built with production sequence numbers. Installation of the 530-meter showroom in its 4th ﬂoor Singapore location carefully followed the model sequence numbers and was completed without any drilling into the material.